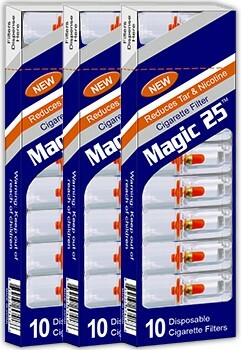 With use of Magic 25 filters you reduce nicotine intake which in result reduces your nicotine dependency. 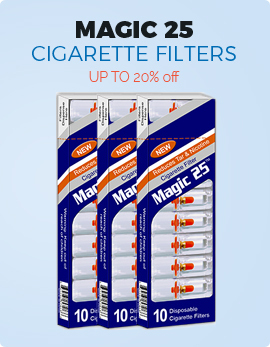 Magic 25 filters are clear so you can see the amount of tar, nicotine and hazards NOT entering your lungs which otherwise will stick to your teeth gums mouth throat and lungs. - No change in cigarette taste or draw. - Reduces intake of hazards in to your lungs. - Drastically reduces nicotine intake. 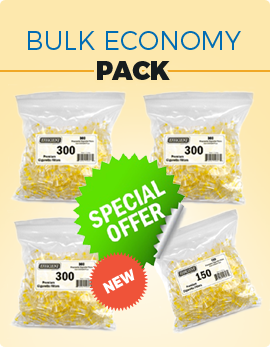 - Significantly reduces nicotine dependency. - Smoke dependency and cravings are reduced. - Simplifies quitting smoking process. - You will notice morning cough disappear. Better morning breath and taste. - Regaining natural color of your teeth. - No more brown black spots on your fingers. - Less substances are released back into the air. - A smoother taste is achieved. - Conveniently dispenses 1 filter at a time. Each Filter is good for 5 - 7 cigarettes.